I hate meatloaf that comes out heavy. While I realize that meatloaf in and of itself is not a light meal, there has to be one that’s at least NOT like a rock in my stomach. Does this recipe meet that requirement? I made meatloaf once… ONCE. It came out orange and rock hard and completely disguisting. I’ve been too afraid to try again. But I sort of love meatloaf, so maybe I should try this recipe. Or maybe when my mom comes to stay for a week after the baby comes, I’ll have her try the recipe. That sounds like a better idea. I can’t stand real meatloaf. I make lamb loaf, though, with goat cheese in it and its heavenly. Cheese makes everything taste better. I totally need to steal this recipe for my uncreative self. Laughing at the potato pic because I can actually do those. If I do the meatloaf and potatoes my family may faint. Looks delish, and don’t you know? 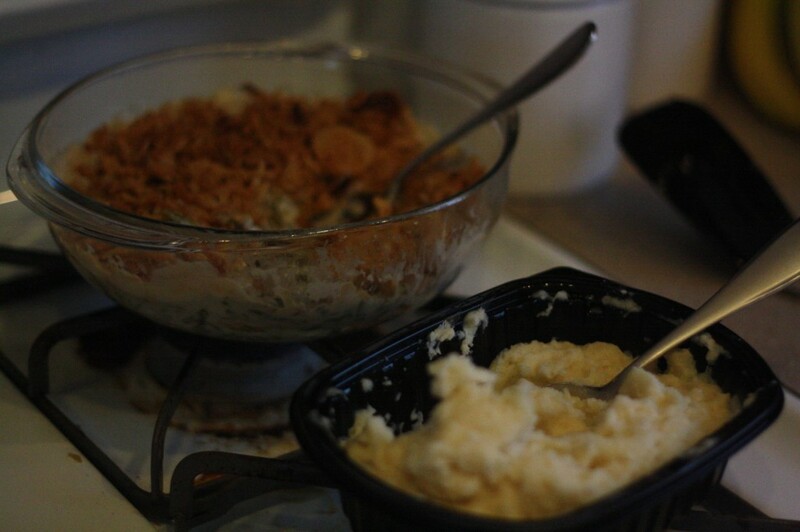 Instant mashed potatoes are totally the best! I seriously gagged at the thought of meatloaf. My mom makes (made) it the same way and I could never stand it…with the chunks and the ketchup. But this? Ohmigawd looks delicious. So trying it. Oooooh! 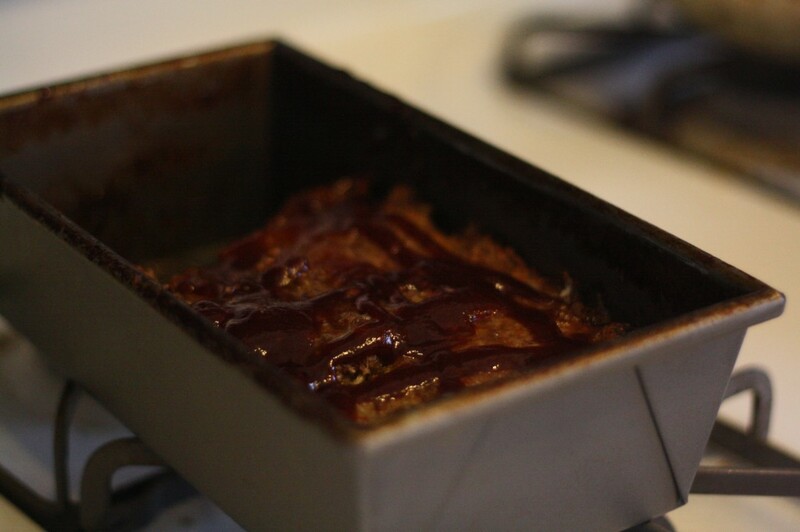 My husband would eat this kind of meatloaf since it involves barbeque sauce. I’m totally making it! You now have my attention. This may work for us. Thank you for a true game-changer. Mmmmm that looks delicious!! I’m thinking meatloaf tonight! Ps. Is your title from sesame st? 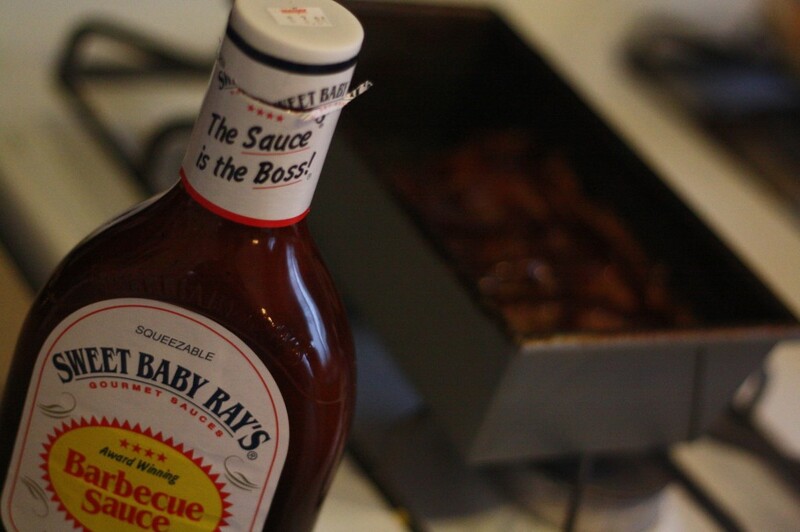 My family loves anything with Sweet Baby Ray’s in it. On it. All around it. Plus, everything else I know how to cook I’ve made 247982734927 times, so I’m due for something new. Thanks for the recipe – and the Christmas Story smile. Big fan of meatloaf. My momma’s, my MIL’s and my own. But your description of your mother’s reminds me of an Eddy Murphy skit about burgers – with the peppers and onions. Dayum, that’s funny. First? A Christmas Story! Second? I cannot wait to make it. BBQ sauce on top just sounds right, why didn’t we ever try that before? Thanks!!! This looks YUM! Can’t wait to try. Love the title of this post – I’ve been repeating it all morning! my favorite meatloaf is the Pioneer Woman’s. Probably because it’s topped with bacon. Nom! This looks sooooooooo good! I was wondering what you meant when you said you were going to put up a recipe for meatloaf! I take a meatloaf recipe and fill muffin tins with it so you have individual meatloaves. They freeze great and they’re so easy to warm up. I make a huge batch periodically. I’ll have to try it with this one! Sounds YUM! you know what is really, really good in meatloaf? oatmeal! 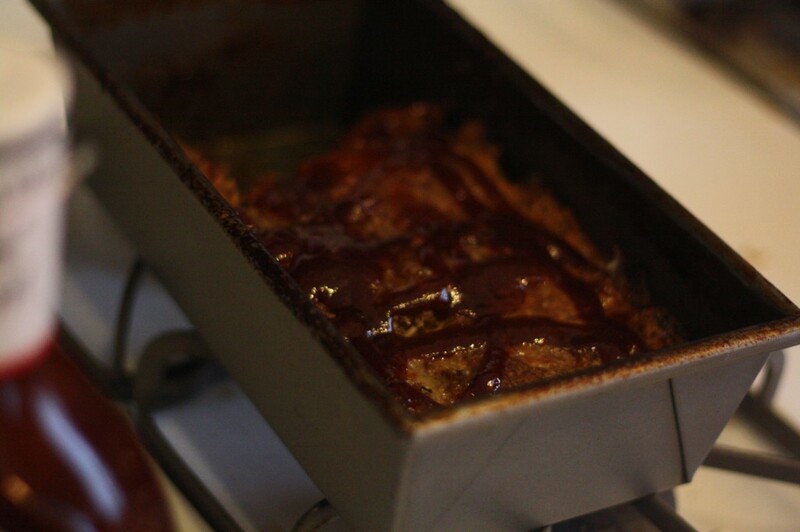 Yum…I am not a typical meatloaf fan, but this looks great! Real Simple is one of my faves! My son LOVES meatloaf, but I never cook it. If I ever care to, I will use this recipe that you posted. I LOVE Real Simple recipes; I use them all the time and post quite a few on my blog. My husband has been asking me to make meatloaf for years. I had the same meatloaf as you growing up, hated it. This recipe I have to try. Oh, and that is one of the best Christmas movies ever! Omg you don’t know how much the hubs and I love Sweet Baby ray’s!!! We can be friends! I used to hate hot meatloaf, but loved it cold as a sandwich the next day. Now I make meatloaf muffins or mini meatloafs so every serving is crusty. Yummy.